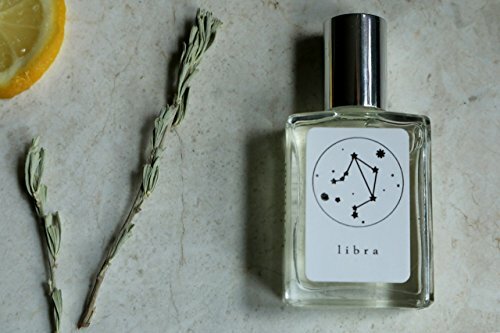 ~Wear the Libra scent for sociability and peace~ (September 23-October 22) Libras integrate harmony into their lives and relationships, striving to make everything beautiful and fair. When truly balanced, they operate best in social settings, exuding a warm and loving aura. Influencing our lives in some way, is each planet and zodiac sign, which can be found somewhere in our birth chart. Libra in your chart, opens up the social world with grace harmony. To balance the Libra fragrance, brilliantly fresh and herbaceous Essential Oil of Cypress creates the stability of separate but equal. Refinement and grace shines from the heart, with charming floral notes of Violet and Water Lily floating lightly, above a base of Amber, and Sandalwood, representing good taste. Lovely top notes of Lime and Bergamot are characteristic of Libra's friendly attitude, infusing joy with every intention. D E T A I L S: ◆This roll-on fragrance is a 1/2 oz (15ml) of pure oil, including fragrance oils and botanical extracts. Completely gender neutral scent absolutes to wear on any occasion. ◇The bottle is placed in a velveteen pouch to carry your scent with you, and an informational card about the fragrance with the therapeutic qualities it incorporates into its aromatic magic of balancing personality and spirit. ◆This is a completely custom composition of oils, handmade labels, and fragrance descriptions built from research and experience. ◇Vegan & cruelty free. No petrochemicals. No parabens. No sulfates. No phthalates. Made in USA. ○These 12 alchemical blends, inspired by the 12 Zodiac signs familiar in the constellations, are less about exclusivity of specific sun signs, and more about finding what is asking to be balanced in personality, and smoothing in the quirks of temperament with aromatherapy, bringing the wearer, a sense of wholeness. If you have any questions about this product by Intuitive Essence, contact us by completing and submitting the form below. If you are looking for a specif part number, please include it with your message. Essential oil bottle rack / holder, handmade storage organizer for 26 EO bottles, wood 2 tier shelf display for oils, patent pending flexible bottle design holds both 5ml and 15ml bottles! 4 colors! Tula-Ananda Pitta Cooling Room & Body Spray 2 fl. oz.